The full report includes both a State of the Industry section and a premium data and analysis section. Some highlights can be found below, with a topline overview of market developments in 2017. For more detailed industry figures, visit the 'About the report' page to see the in-depth data available to purchase in the full report. 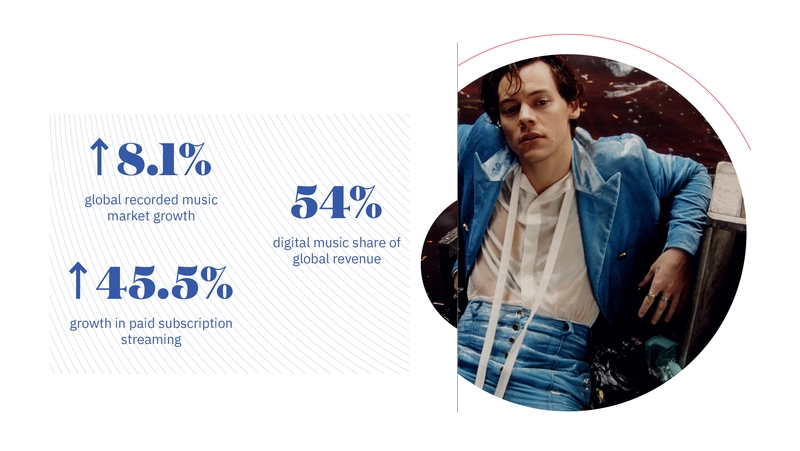 Driven by fans' engagement with streaming – especially paid subscription audio streaming – digital revenues now account for more than half (54%) of the global recorded music market. Total streaming revenues increased by 41.1% and, for the first time, became the single largest revenue source. By the end of 2017, there were 176 million users of paid subscription accounts globally, with 64 million having been added during the year. However, to put this recovery in context, total industry revenues for 2017 were still just 68.4% of the market’s peak in 1999. 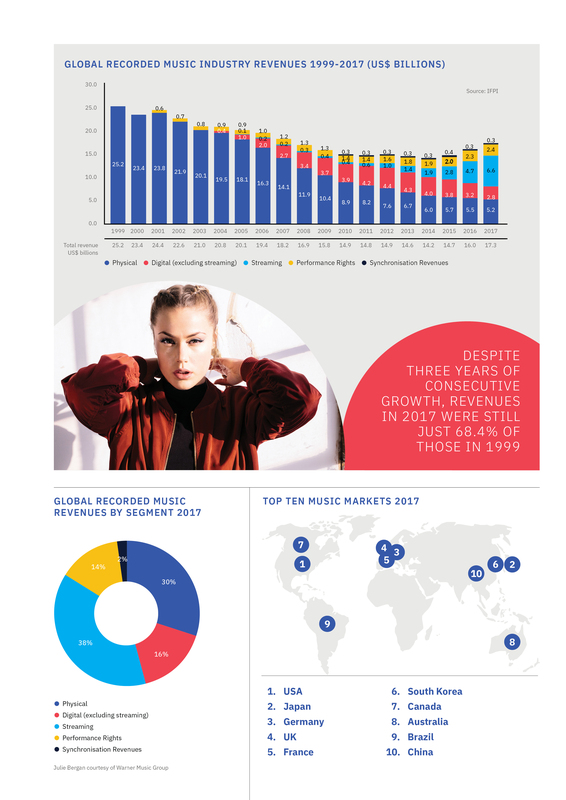 Against the backdrop of a global market that had endured 15 years of significant revenue decline, record companies are working to fuel the recent return to growth and ensure music creators receive fair value. This renewed growth is a result of record companies’ ongoing investment, not only in artists, but also in digital innovation that is enriching fans’ experiences and harnessing technology such as voice-controlled home speakers and much more. 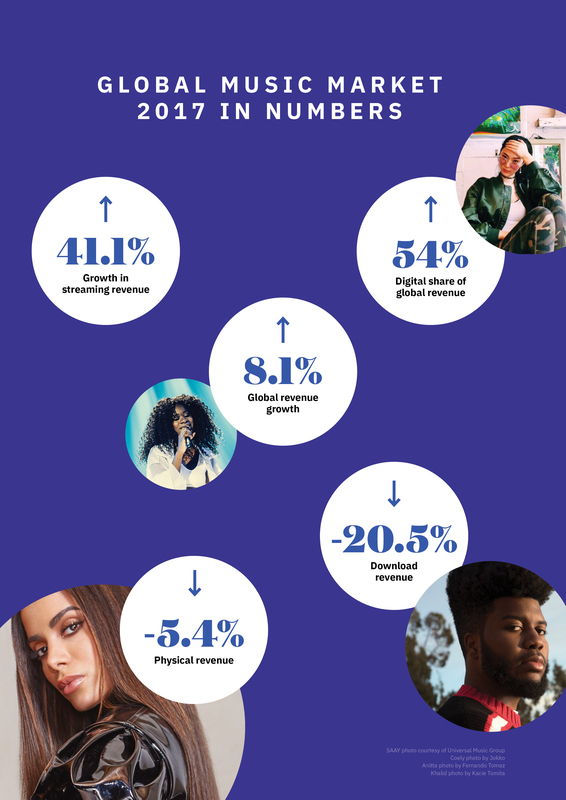 Even beyond their constant efforts to break and nurture artists, music companies have worked to foster growth in developing music markets, in particular by creating engaging ways for fans to access music on multiple services and platforms. However, copyright infringement remains a widespread and evolving problem, with stream ripping emerging as the latest issue facing the music community. The industry remains united in its commitment to solve the value gap, the most significant roadblock on the path to sustainable growth, where certain online user upload services exploit music without returning fair revenue to those that are creating and investing in it.